Sometimes a landlord may allow subletting, but require further restrictions or obligations on the subtenant. The most useful of these is the ability to "bypass" the sublessor and deal directly with the subtenant if necessary. By setting these terms, the head landlord can proceed without the necessity of establishing the default of the sublessor in court. When someone wants to litigate, nothing can be certain. But the sublessor cannot sign to this sublease then later deny these rights of the head landlord. Your sublease can follow or deviate from the terms of the original lease as much as you like. You could carve out the sublease from the head lease with the same terms, or alternatively, specify different terms and impose further obligations on the new tenant. the whole property, split into separate units, to multiple tenants (perhaps at relatively higher individual rents so that the original tenant profits). This agreement is suitable for any commercial property including office buildings, shops and retail units, industrial units such as workshops, warehouses and factories, and even land. Because subleases deal with legal issues in the round, the form of sublease required for a shop on the high street is not different from the form required to sublet a scrap yard. If you are subletting only part of the property you will need to look afresh at how responsibilities such as service provision, access, insurance and so on are split between the head landlord, you the sublessor and your subtenants. We provide for many different possible options. This is a very flexible document. The sublessor should first check the original lease. Subletting may be allowed and if so, the permission is likely to be subject to specific conditions. If not allowed, it may be possible, with the landlord's consent, incorporate terms in favour of the head landlord in return for allowing subletting. Plain English is used throughout except where it is necessary to use legal terms common in land law. This sublease is one of a collection of commercial lease templates designed for use by property professionals: experienced landlords, solicitors and surveyors. Accordingly, the provisions are very thorough. The document includes the (optional) provision to release the old guarantor from his obligations as the new guarantor takes over. Commercial leases in New Zealand are governed by the Property Law Act 2007. There is no legal requirement that lease must be registered. However, the parties have the option of protecting their interests by registering the lease. A sublease carved out of a registered head lease should itself be registered. We offer two subleases. This version has been drawn for circumstances where the head landlord requires deeper and more detailed involvement in the relationship between himself and the new subtenant. If you don't need these provisions, you may be interested to look at: Underlease agreement for commercial property. 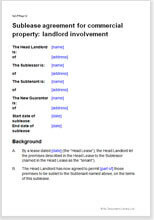 Note that this document is not suitable for subletting residential tenancy agreements. In those situations, we recommend cancelling the original and using a new tenancy agreement to let the property to the new tenants.